Ikwo, Nigeria—Chinyere Francis loved working on her farm in the rural town of Ikwo in southeast Nigeria. But she worried that neither her earnings nor her husband’s $15 monthly income as a pastor in his local church were enough to take care of their growing family. With the latest addition—their tenth child—the couple appeared exhausted at the prospect of yet another mouth to feed. 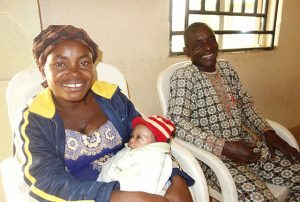 Chinyere Francis and her husband opt to use a family planning method following the birth of their tenth child at a health center. 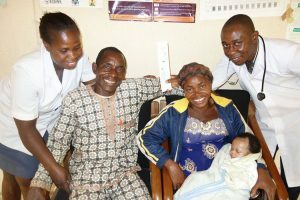 Families like that of Chinyere Francis benefit from the training of more than 220 health care providers in delivering safe, effective family planning services. The work of USAID’s Maternal and Child Survival Program is focused on addressing women’s reproductive health needs in two states in Nigeria. However, the situation is changing in two states—Ebonyi and Kogi—where the government of Nigeria and the U.S. Agency for International Development’s global flagship Maternal and Child Survival Program (MCSP), led by Jhpiego, are working together to expand access to high-quality family planning services and modern, highly effective, long-acting and low-cost contraceptives, such as intrauterine devices (IUDs) and implants. In partnership with Save the Children and R4D, Jhpiego has trained more than 220 health workers in the two states to effectively provide these family planning services. Within six months of the start of the training program in December 2015, more than 1,700 women in Ebonyi and Kogi States received family planning counseling following the birth of a child. Between January and August of this year, 527 of these women received their choice of a modern contraceptive—a promising development in two states where acceptance of family planning methods has been low in the past. Tolase Olatinwo is the Knowledge Management Advisor; Gladys Olisaekee is State Team Leader/Maternal Health Advisor; and Uduak Fred Okum and Rita Anaba are Service Improvement Facilitators in Jhpiego’s Nigeria office.